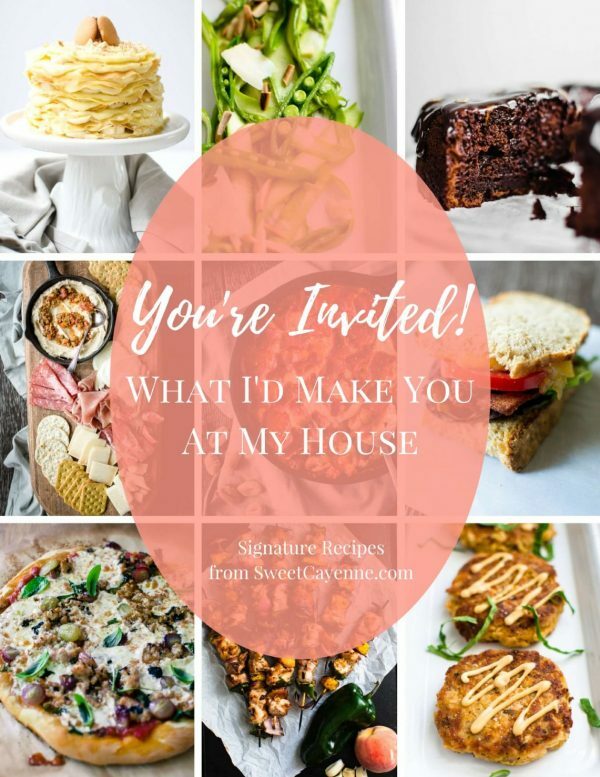 Whose ready for major yumminess today??? 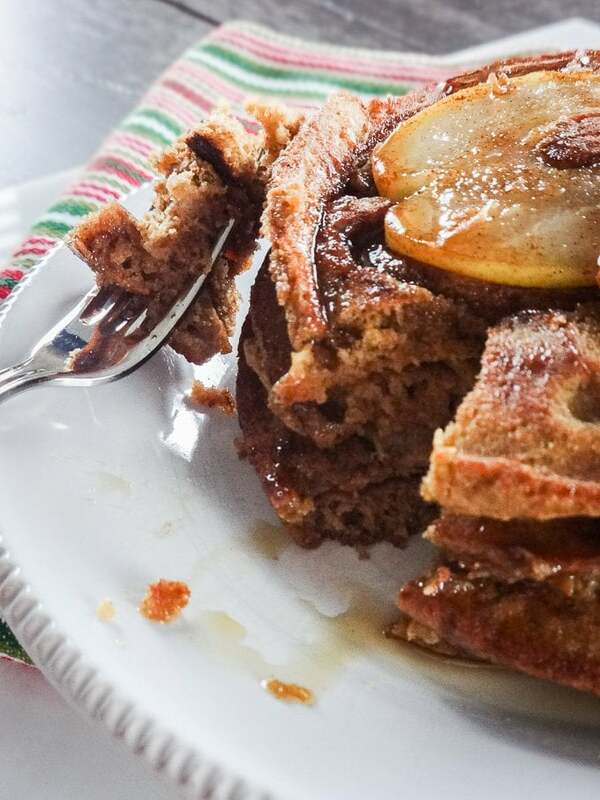 I mean, seriously, one look at these gingerbread pear pancakes and my heart literally starts to beat a little faster. Jingle bells start to ring. I have a sudden urge to play Christmas music, wrap presents, and invite everyone I know to come over for a cookie exchange. To be honest, I’d never made gingerbread pancakes before this year. My inspiration to make them came when Ryan and I built our first gingerbread house. 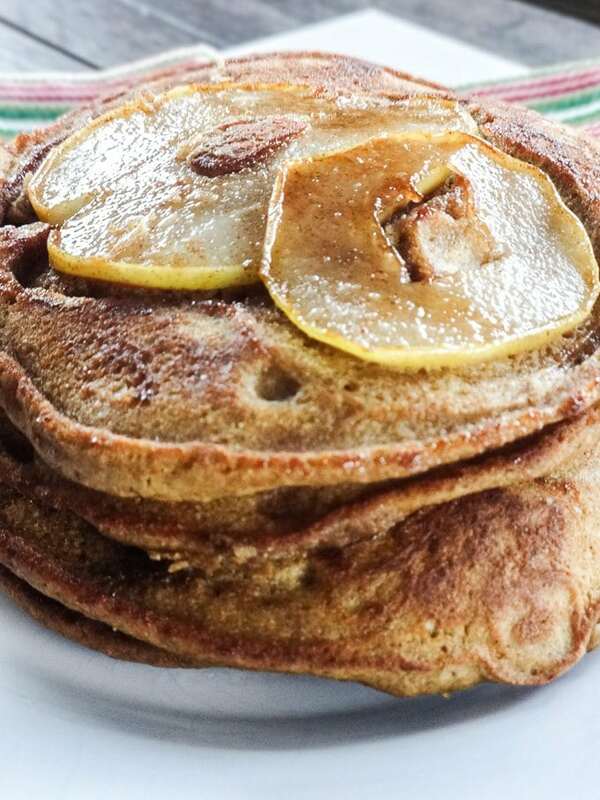 I knew I REALLY had to make them and fill the centers with caramelized pears when my mouth dropped open wide at the sight of the gorgeous apple filled pancakes from Pinch of Yum. We really should all make more pancakes with caramelized fruit cooked into the center. This is one of those recipes I wish I had been making for years now, because they really are just delightfully festive and oh so yummy. I’m thinking they will be the star of many Christmas morning breakfasts to come and I can’t wait to make again them for family and friends. On a side note, I found it was easiest to get a perfectly round 6” pancakes by cooking one pancake at a time in a 6” skillet. I kept the pancakes warm as they were cooked on a baking sheet in a 250 degree oven. Leftovers were excellent the next day and the next after being heated in the oven at 350 for about 8 minutes – enjoy! 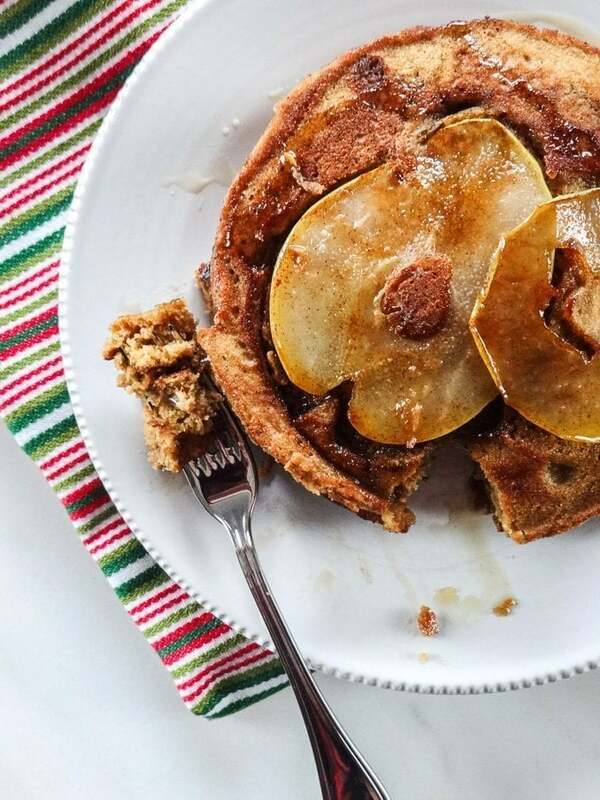 Gingerbread pancakes are a warm and spicy treat to serve for a Christmas brunch or Santa breakfast. 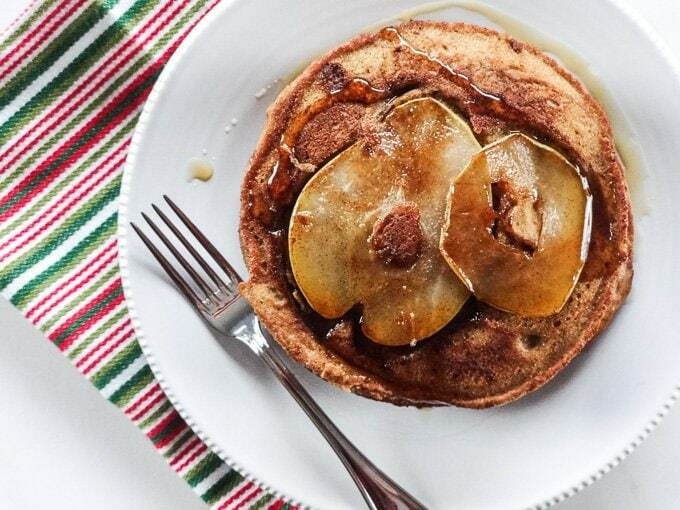 Each fluffy pancake has a sweet and caramelized pear in the center. They are wonderful with maple syrup, cranberry compote, a side of Greek yogurt, or all three! Use a paring knife to cut a small teardrop shape out of the center of each pear slice. Combine the flour, sugar, brown sugar, and cinnamon in a small bowl. Dip each side of the pear slices in this mixture and shake to remove any excess mixture. Lay the pear slices flat on a plate within reach of your stovetop. Heat a nonstick skillet or griddle over medium heat. Place 1-2 teaspoons of butter in the skillet/griddle with each batch of pancakes that you cook. Place 2 pear slices per pancake in the skillet, with the slices slightly overlapping each other. Let them cook for about 60 seconds before covering them completely with a heaping 1/4 cup of the pancake batter. Cook for 4-5 minutes until the edges of the pancake look dry and bubbles have formed on the surface of the batter. Carefully flip the pancake and cook 1 minute more. Transfer pancake to baking sheet in the oven to keep warm until you are ready to serve. Continue this process with the remainder of the batter and pear slices - you should be able to get a total of six 6'' pancakes with 2 slices of pear in each cake. Gorgeous!! I love how you left the pear rings on top like upside down cake. 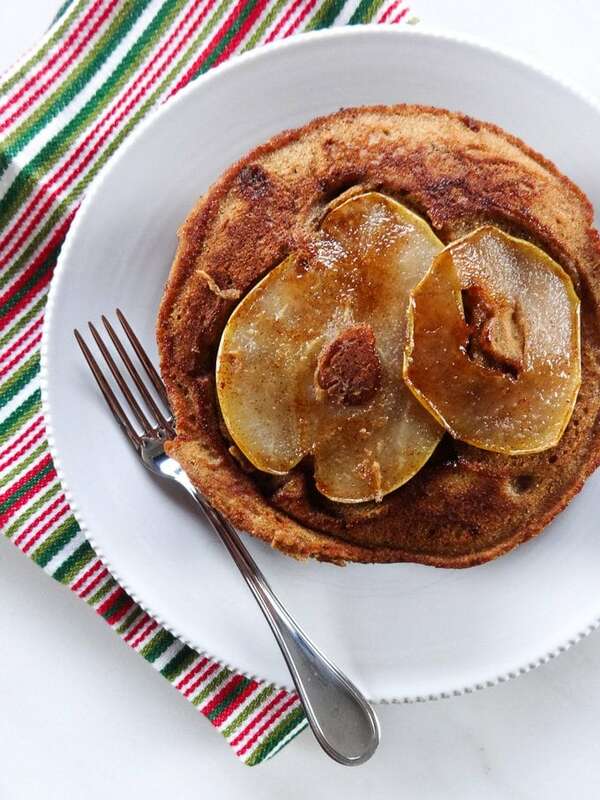 I don’t love gingerbread cookies but I’m thinking I need to try some gingerbread flavored things again and these pancakes are a perfect starting point! YES! These totally say holiday cheer and joy! I always make one pancake at a time too and keep others warm in the oven! 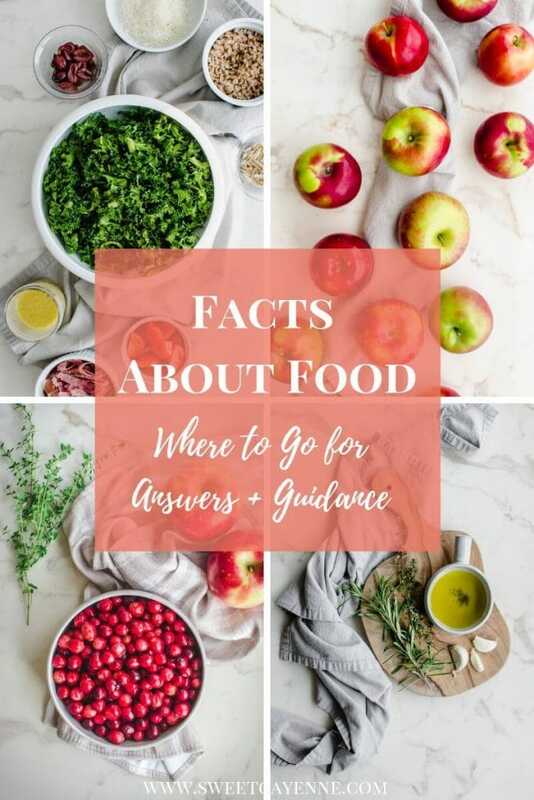 It is such a fun “trick” to know! Yes! Glad to know you do the same – it takes longer but you get a prettier pancake!